2014 Kia Forte Pros and Cons: Why (Not) This Car? Little respected even a decade ago, in recent years Hyundai and Kia have been hitting the mark in an increasing number of segments. But they've been essentially absent from the product class that best combines two of their specialties, practicality and affordability, with driving enjoyment: performance compacts. Where's the Korean GTI? With the latest Forte SX, Kia offers the duo's most credible performance compact to date. They're not yet ready to make a run at the recently upgraded Volkswagen GTI. Otherwise, the car would pack the corporate 240-plus-horsepower 2.0-liter turbocharged engine. Instead, pop the semi-hot compact's hood and you'll find the 201-horsepower boosted 1.6 first seen in the stylish but dynamically underwhelming Hyundai Veloster. But power isn't everything. A compact car can be fun without wheel-spinning gobs of it. The car model to which the segment second-most owes its start, the Honda Civic Si, continues to resist the torquey lure of turbocharging (though this could well change when it is next redesigned). The Forte SX and Civic Si also happen to be the only two cars in the segment still available as coupes. We have our comparison. Note: I tested the Civic Si sedan, but do not expect the driving experience to differ much in the coupe. Also, while I tested 2014s, neither car has been revised for 2015. Why the 2014 Kia Forte? Back in the 1970s and 1980s, Honda was known for loading its cars with thoughtful accessories as standard equipment, coin holders and the like. But the company was slow to equip its cars with upscale features, for a long time limiting even leather upholstery to special editions. You still can't get leather in the Civic Si. In the Forte SX, a sunroof is part of a $1,900 Premium Package that also includes leather and a few other things. If you want nav, it's part of a $1,900 Technology Package that requires the previous. Check both boxes, and you end up with many features not even available on the Civic Si--or on many other compacts, for that matter. These include the aforementioned leather upholstery, heated front seats, a cooled driver seat, a heated steering wheel, automatic climate control, rear air vents, power-folding mirrors, a universal garage door opener, and HID headlights. Even a few years ago you couldn't get a cooled driver seat, a heated steering wheel, or power-folding mirrors on any car with a price in the mid-twenties. This is a serious load of kit, to borrow a Britishism. One thing not on either coupe: a power driver seat. One attends the four-door hatchback Forte SX. I suspect it's absent from the Koup to enable the seat to easily tip forward for access to the rear seat. A power lumbar adjuster (not available on the Honda) survived the purge, though. The thing that gained Kias a foothold in North America, their relatively low prices, continues to be a key strength. Assuming you want floormats, the 2015 Kia Forte Koup SX starts at $21,505, $2,205 below the Civic Si. The Honda does have some additional standard equipment, most notably a sunroof, a limited-slip front differential, and a blind spot camera, that accounts for about $1,250 of the difference, leaving the Kia with a roughly $1,000 edge. But maybe you want a sunroof and navigation. Add these, and the two cars end up with similar stickers, $25,305 vs. $25,210. But, as noted in the "feature availability" section, the Kia now includes many things not available on the Honda. Adjusting for the feature differences between fully optioned cars doubles the Kia's edge to about $2,000. Those option packages are a good value. You'd rather have a four-door hatchback? Well, all Civics have trunks, at least not on this continent. The most direct competitor for the Forte5 SX is likely the 184-horsepower Mazda3 s. Compare the Kia with both packages to the Mazda in Grand Touring trim, and the former lists for $335 less, $26,005 vs. $26,340. Quite close. The Mazda manages to include some features not available on the Forte SX, including a blind spot warning system, a head-up display, steering-linked headlights, rain-sensing wipers, and surround sound. 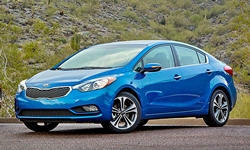 But the Kia retains a $300 feature advantage, since many of the previously listed features aren't offered on the Mazda. Plus the hatchback, unlike the coupe, includes a memory function for the driver seat and a heated rear seat. For those not feeling the need for the SX's turbo engine, sport suspension, and 18-inch wheels, the Forte is offered in lesser trims. The Forte Koup EX, with a 173-horsepower 2.4-liter engine, is nearly as quick. But, perhaps mindful of this, Kia only charges about $1,000 more for the SX bits--surprisingly little. Furthermore, your options are limited with the EX. You can't get either package with the manual transmission on the Koup EX, and you can't get a manual transmission at all with the sedan or hatchback. If you want a manual transmission with the nifty features listed earlier, the SX it is. Want an automatic transmission? Then add $1,000 to the above prices. Unless the car in question is the Civic--which doesn't offer one. This said, people often buy Civics because they'll rarely require a repair within the additional scope of the Kia's warranty. So in this comparison the Kia's longer warranty isn't a huge advantage. Kia didn't want to sell cars based on features, pricing, and warranty alone, so they hired one of Audi's star designers. Mission accomplished: the Forte Koup, with shades of the Audi A5, has the sophisticated styling of a much more expensive car and is far more attractive than the Civic Si (which took a turn for the worse with a 2012 redesign). The Forte SX's interior isn't as striking as its exterior, but it includes some interesting details and easily out-classes the somewhat bizarre Civic Si's. Materials are at least as good as those in the Civic, and better than many people expect in a Kia. People who need a roomy rear seat don't often buy coupes. So with the Civic Si the coupe is an inch and a half shorter (in both height and length) than the sedan, which translates to nearly three inches less headroom and nearly five inches less legroom in back, making it a very tight fit for even modestly sized adults. Those who do want a roomy rear seat in their coupe will be much happier with the Forte. Compared to the sedan, Kia shaved the Koup's roofline an inch but kept the wheelbase the same. Sitting behind my 5-9 self, I had about an inch of clearance over my head and a hand's-width ahead of my knees. Switch to the four-door body styles, and both cars are about equally roomy in back. But only Forte rear seat passengers enjoy rear air vents--in every body style. Why Not the 2014 Kia Forte? I've made it through the top reasons to buy a Kia Forte SX, but no mention of performance and handling (the reasons to upgrade from lesser trims) yet. But neither is the top reason not to buy one, either. Okay, maybe handling is. I'm trying to decide as I write this. Handling definitely isn't the car's largest weakness. That would be fuel economy. With a manual transmission, the Kia Forte SX achieves worst-in-class EPA ratings: 22 mpg city and 29 mpg highway. (The automatic goes a mile farther on each highway gallon.) Mind you, the Civic doesn't do much better, with 22/31. But the big-engined Mazda achieves 25/37 with a manual, and a lofty 28/39 with an automatic. And the much quicker Volkswagen GTI scores 25/34 and 25/33, respectively. The Forte EX, with its larger but non-turbocharged engine, is more competitive: 24/33 with the manual and 25/36 with the automatic. Maybe the Forte SX just doesn't test well. In my suburban driving the trip computer reported averages between 25 and 40 (depending on the frequency of stops and the heaviness of my right foot), with most in the low 30s. The trip computers in the Honda, Mazda, and Volkswagen all reported about the same. The Kia's trip computer also reported better-than-EPA averages on the highway, but not by as wide a margin. Short gearing restricted 70-mph-highway averages to about 33, well short of the high 30s observed in the others. I think I will put handling here. The Forte SX handles competently, with good control and a moderate amount of roll. I found the coupe very pleasant to drive. Its Nexen tires don't squeal, even if you turn off the nearly seamless traction control and push them near their limits. Torque steer under hard acceleration is minimal. In my notes I describe the Forte SX as "almost fun." The trouble is, with the other cars you can drop the "almost." The largest problem is with the Forte SX's steering. You can vary the wheel's heft among three levels, but in none of these does it provide much feedback. The Mazda's steering in particular feels more involving. The Honda Civic Si's steering, though light for that of a performance-oriented model, inspires confidence and delivers joy with its quickness, natural feel, and nuanced feedback. (Though the Si's limited-slip differential can make the steering squirm during aggressive turn exits.) The Mazda, Honda, Ford Focus, and Volkswagen GTI all feel sharper, more precise, and more eager to change directions. Beyond the steering, while the Forte SX manages curves pretty well, it doesn't beg to be hustled through them. That spark that distinguishes truly fun cars (including the Civic Si) isn't quite here. The Forte Koup SX might seem sportier if its driving position were a little lower. As is, you sit quite high for a coupe. (I might have minded this driving position less in the hatchback.) On the flip side, this position well above the Kia's less massive instrument panel benefits forward visibility. I'm not a fan of the massive bi-level panel in the Civic; it's my least favorite thing about the car, followed by the number of taps required to do just about anything with the knob-free infotainment interface. And the driver seat? My notes describe it as "okay." The Civic Si's more aggressively bolstered, cloth-trimmed bucket provides more lateral support in hard turns. You'll find comfortably upholstered arm rests on the doors in both cars. The upside of the Kia Forte SX's softcore suspension tuning is, some sharp vertical motions on patchy movement notwithstanding, a thoroughly livable, fairly quiet ride. Then again, none of the cars in this group threatens to dislodge fillings, so the Forte's advantage isn't large, and is small to nonexistent compared to the Civic Si. The Kia has a larger advantage over the Honda in interior noise levels, which are fairly low around town and moderate on the highway. The second-generation Forte sounds and feels considerably more refined than the previous one. In general, though, the days of the highway-unfriendly compact are just about behind us. As turbo engines go, the Kia Forte SX's is admirably refined. Driving it with a light foot on the gas, a challenge for some boosted engines, provokes only a slight unevenness in the engine's power delivery. In most driving its character isn't clearly that of a turbo, boost comes on so smoothly. Once boost does come on, acceleration after a surprising amount of initial wheelspin feels quick but not very quick. Magazine tests suggest times quicker than the Mazda's, about even with the Honda's, and slower than the Volkswagen's. But the experience is much different in the Honda, as the Civic Si's non-turbochaged engine--with a 4,400 (vs. 1,750) rpm torque peak and a 7,000 (vs. 6,000) rpm power peak--must be revved much higher than the Kia's to match the latter's output. And when the Honda's engine is revved it makes far more thrilling noises. The Forte's stick shift might be a little better than the Hyundai-Kia norm. Meaning it's perhaps average. The shifters in the Honda and Mazda have a tighter, more precise, entirely more satisfying feel. They're easily the best in the class. That in the Volkswagen falls closer to the Kia's than to the others. The Kia Forte SX doesn't provide a Civic Si, much less a Focus ST, level of of thrills; that will have to await the company's next attempt at a performance compact, perhaps with a larger engine. But it looks good, drives well, has a long warranty, and includes scads of upscale features for a relatively low price. If a cooled driver seat or a heated steering wheel matters more to you than a frenzied rush to the red line, then it's probably the best performance compact for you. Kia and Honda each provided insured cars for a week with a tank of gas. 2014 Kia Forte pros and cons, according to Michael Karesh: the best reasons for buying (or not buying) the 2014 Kia Forte. Join TrueDelta to post your own impressions. Older Civics were head and shoulders above their competition. Not even remotely comparable. I have a 91 hatch 5-speed parked in my summer home, looks like new, low miles (abt 50,000 only, bought new) and over 24 years, nothing ever went wrong with it. Not only that, it is a real joy to drive. No corolla or sentra even comes close. I have driven Hyundai-Kias in the past (rentals) when they had no Toyotas to give me, and they were mediocre at best. As I am not in the market for this type vehicles any more, I have not bothered to test drive more recent H-K's, but their styling does not impress me, they are not hiding the undrelying econobox with poor handling with these flames. I've had a 2014 Forte Koup for 2 days. Michael's review is spot on. I like the car. I did not buy it to take to the track or thrill to a 7,000 rpm torque peak.